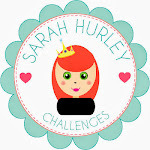 Sarah Hurley 365 (Formerly Sarah Hurley Challenges): Stamping on fabric. As the sun was shining, the covers came off the terrace furniture and I felt like brightening things up a bit, so I made this cute plant pot stick in about an hour. It was that quick. 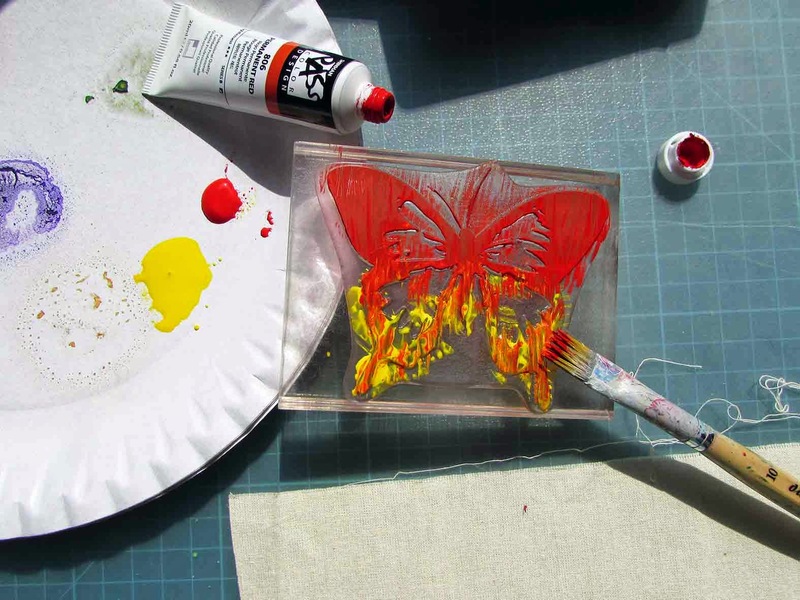 To make one of your own you'll need a piece of plain white cotton or calico, twice the width of the butterfly (I'm using the Large Monarch Butterfly stamp ). Instead of using ink I decided to see how paint would look. This stamp has a large surface area which is perfect for adding colour onto. I used Shin Han water colour paints (soon to be found at Sarah Hurley ) straight from the tube and even though it's water colour paint I knew I wasn't going to allow my butterfly to get wet. Of course If you're worried about it you can equally use a water proof ink or acrylic paint. I used a paintbrush and blended the colour directly on the stamp. I was doing this in a sunny window so needed to give it a quick mist before stamping as some of the paint had started to dry. I stamped straight down onto the calico and the print was much more vibrant than if I'd used ink. You NEED to wash your stamp straight away otherwise the paint will dry in the holes. 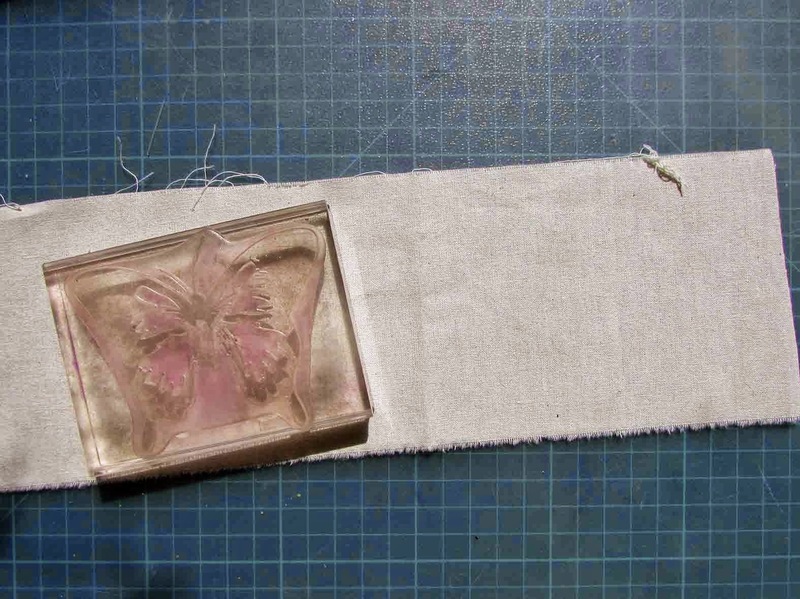 After doubling over the fabric, I cut around the butterfly. 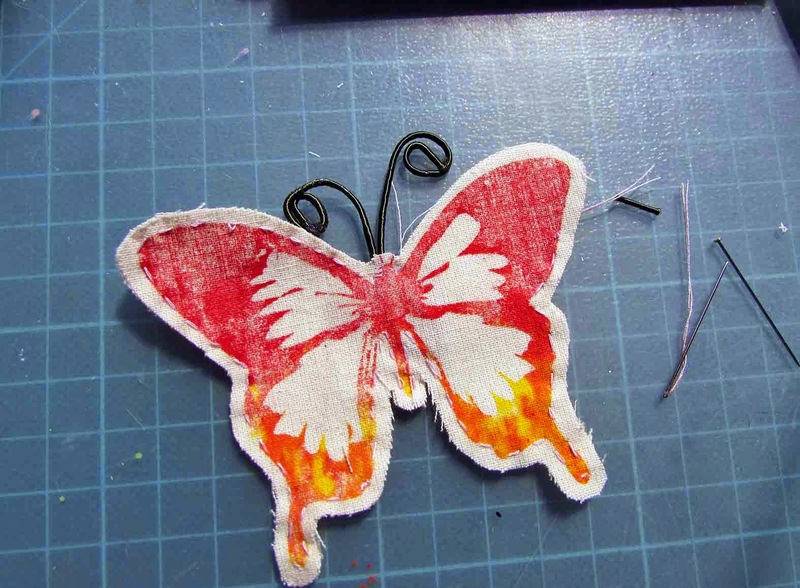 A piece of wire sandwiched in between the layers acts as the antennae, then I sewed around the two butterfly pieces leaving a small hole for stuffing. 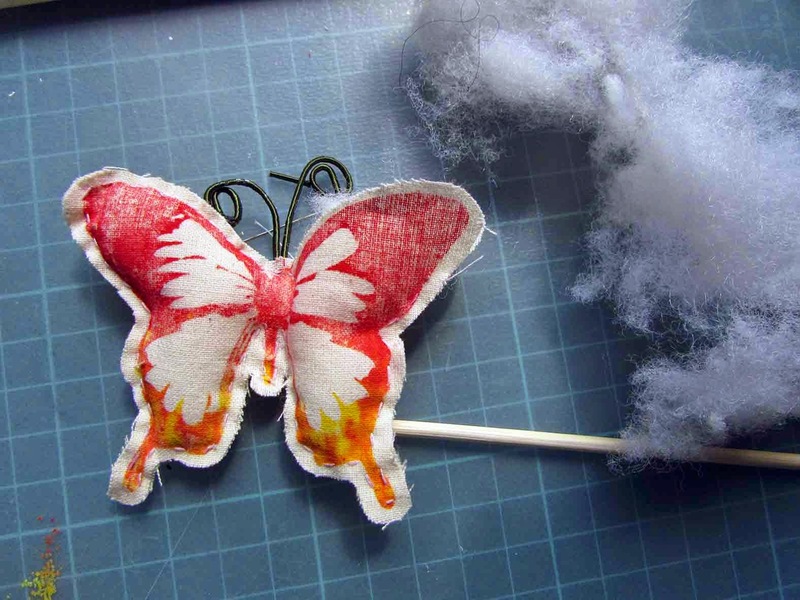 To give my butterfly some dimension I stuffed it with some wadding using a bbq skewer then closed up the hole. Finishing it off I put a little glue on the tip of the bbq skewer and pushed it into the body, I tied some ribbon around the stick and decided to cut shorter my antennae. I also fluffed up the edge to make it more tattered looking. 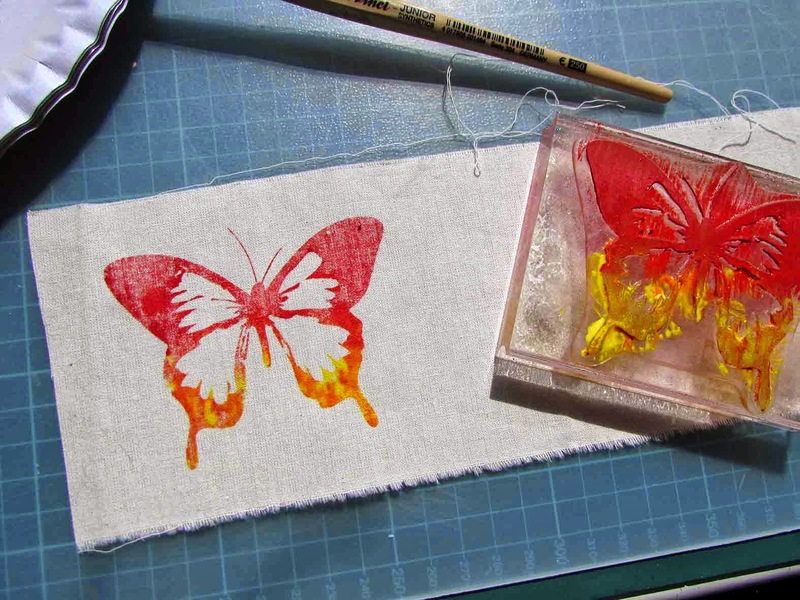 You could make your own stamping onto card instead of cotton or if you don't like sewing, back some cotton with card, stamp then cut out the butterfly. 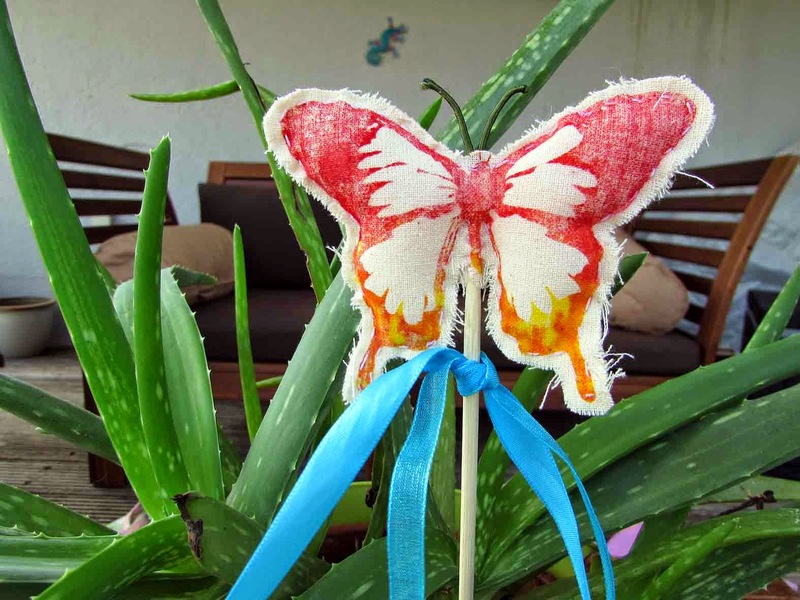 How about bunting butterflies? Mmmm maybe I'll try that! Well it looks fabulous, came out really well! And looks brilliant in the pot!